Update: I've revised this, possibly the most popular umeboshi recipe in English online, to include some key troubleshooting notes. Originally published June 18, 2009. My mom has been making a batch of umeboshi every year since, and I've also added some more notes from her. My mother came for a visit this week, bringing along a pot of her homemade umeboshi. I asked her to tell me how she makes them; not only did she write it down for me, she even had pictures she'd taken of her attempts in the past couple of years! So, here is my mom's version of how to make homemade umeboshi. I've freely translated her Japanese explanation to English. My mother [my grandmother - maki] used to make umeboshi every year. When I lived in New York, I was too busy working to do much cooking, let alone umeboshi! But now that I am retired, I'm trying to remember how to do things the old way. Homemade umeboshi is so much more delicious than store bought, so they are worth the effort. You only need 4 ingredients to make umeboshi: Ume plums, coarse sea salt, red shiso leaves and shochu or shouchuu, a type of distilled alcohol beverage that is available all over Japan and is quite inexpensive. If you can't get shochu, you can use vodka or another kind of flavorless distilled beverage. You also need some bowls, flat baskets, a large, wide-mouth, a deep container made of ceramic or glass or non-reactive plastic (never metal), a weight or a sturdy plastic bag, and large jars to store your umeboshi. In Japan, umeboshi are always made in mid to late June, because that's when the ume plums are ready. Ume plums are picked when they are hard and very sour. The kind I use are from the Kishuu region, which is in Wakayama prefecture. 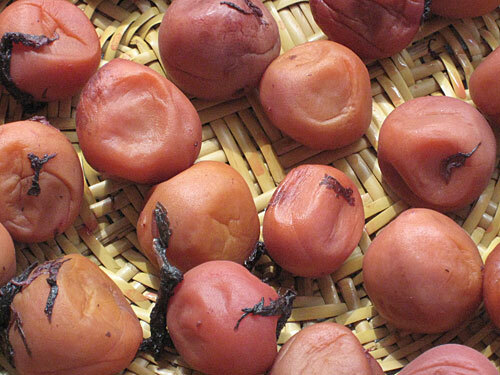 Kishuu ume are widely regarded to make the best umeboshi. I understand that ume plums are now available in the United States. When you buy them, make sure you choose ones that are firm, plump and unblemished. Even small blemishes or cuts on the plums could lead to mold, which is the biggest reason umeboshi can fail. Once you have the ume plums, carefully remove any remaining stems. The best way to do this is with a cocktail stick. Try not to pierce the ume plum when you're doing this - again, this can lead to mold. Once the stems are removed, wash the plums in several changes of water, and then fill a large bowl with cold water and leave the ume plums to soak overnight. This gets rid of some of the bitterness in the plums. After soaking overnight, drain and dry the plums. Made ready a bowl of shochu or vodka, and dunk the ume plums completely in the alcohol. This is to kill any kind of mold spores on the surface. Red shiso or perilla leaves give color and flavor to the umeboshi. Use about 10% of the ume plus in weight of shiso leaves - so for 1 kilo of ume plums, use 100g of shiso leaves. Wash them, take off any tough stems, sprinkle with a little salt and massage the leaves with your hands until they are limp. Use a non-iodized, coarse salt. I use a coarse sea salt. You can use kosher salt instead. The amount of salt, or the ratio of salt to ume plums, determines how salty your umeboshi will end up. My mother used to make very salty umeboshi with about 20% salt! I prefer mine to be quite low in salt, so I use only 8%. The lower the salt content, the more prone to mold the ume become, so beginners may want to start with 12% or 10% salt. You can also de-salt the umeboshi a little before you eat them, by soaking them in a weak salt water solution (though this does dilute the flavor too). Use a large, wide-mouth jar or other fairly deep container. Wash it inside and out thorougly, then disinfect the inside. Some people do this by putting the container in boiling water, but the most common - and convenient - way is to spray it with some shochu or vodka. Start with a layer of coarse salt. Cover with a layer of ume plums, then a bit of the shiso. Repeat the salt-ume-shiso layers, until the ume are used up. Now, cover the whole thing with a plastic bag or sheet, then put on a weight that is at least half as heavy as the ume plums - in other words, 1 kilo of ume plums requires at least a 500g weight. While there are dedicated ceramic weights available, you can use anything you can find such as a bagful of water (as long as it doesn't leak), a full water bottle, clean rocks in a plastic bag, hand weights or dumbbells, and so on. Once the container is full and weighted down, cover the top with a clean, porous cloth like a cheesecloth or openweave kitchen towel; secure this with a rubber band or string. Leave in a cool, dark area of your house, until the ume plums become soft and completely immersed in a reddish liquid. This liquid is extracted from the ume plums by the salt. This part of the process will take about a week or more. Once the liquid is about 2 cm (an inch) above the top of the ume plums, reduce the weight by half, and leave the ume plums in the jar in the liquid until it's time to dry them in the sun. The hoshi/boshi part of umeboshi means 'to dry', and the following drying step is very important! In Japan, we time the umeboshi process so that the ume plums reach the end of the salting stage around Doyou no ushi no hi （土用の丑の日), which falls on a different day every year, but is always around mid to late July. This date is always marked on Japanese calendars, along with other holidays and special days, just like Christian holy days are marked on European calendars. The significance of this day for umeboshi making is that it occurs after the rainy season is over, when the weather becomes hot and relatively dry (this period is called doyou no hi （土用の日), the doyou period). If you are not in Japan, just look at the weather forecast and aim for a period of a few days when it's supposed to be nice and hot and sunny. Put the ume plums in a single layer on flat baskets, and the shiso leaves in spread-put clumps separately. Here you see that I have lined up the baskets on newspapers out on my apartment balcony. The newspapers protect the top of the table underneath! Leave the plums like this in a fairly sunny place with good ventilation, for about 3 days. If it rains, take them inside before they get wet. Turn them over at least once a day. At the end of the drying process, they look like this. The drying tenderizes the plums, giving them a better texture. The umeboshi are now done. You can store them as-is, in a jar, layering plums with the shiso leaves. Or you can pour back in some of the ume vinegar, to give them a softer texture. This is what I did with this batch. Here's another batch (from last year). I stored some wet in disinfected glass jars, and some dry in a ceramic jar. Umeboshi improves with age for a few years. I usually start eating them 3 years after making them, though you can eat them the same year. At around 5 years I think they are at their best. After about 10 years or so they start to disintegrate and become mushy if kept wet, and rather shriveled like an old lady if kept dry - but they are still edible! You can make umeboshi without the red shiso leaves. This results in light brown umeboshi and an almost clear ume vinegar. I hope you have enjoyed this how-to of a very traditional Japanese preserved food! Submitted by maki on 2011-06-15 09:14. I could never gather the courage to try one of these guys out while I was in Japan (about 10 years ago) to my regret. I really want to try one now. unfortunately if it is high in sodium I cant now! I have high blood pressure so its out of the question... what a bummer! All recipes for the umeboshi call for 'sea salt' not iodized salt that is murderous for those of us w/hbp. Sea salt's actually very beneficial for you, high in all types of magnesiums, great for your brain. One that I use is mixture: 1/2 Mediterranean & 1/2 Alaela Hawaiian. Works for me. Salt should have about the same effect on your blood pressure whether or not it's iodized. Sea salt is no better or worse for you than any other kind, really. Thank you for this tutorial! I love umeboshi, but it's hard to find it without preservatives here. Your mother's photos of the process are wonderful! Since you're on the topic of ume, do you or your mother happen to have a good recipe for umeshu? Goodness. My mouth is watering. I have no idea where to find an ume tree so I'm stuck paying an arm and a leg at the Japanese market. It's neat to see the process. So many things get lost as our older generation passes on. Thanks for sharing! I remember my grandfather climbing the ume tree in his backyard to collect the fruit every year. His umeboshi was the best. I was so sad when my mom set up her private practice on the property and converted the yard into a parking lot. I eat store bought umeboshi but it just isn't the same. Most of the commercial umeboshi contain sugar, MSG and other flavoring ingredients since many people don't prefer the sour and salty taste of traditional umeboshi. This post reminded me to ask my gradfather for his recipe. He's getting old and rather senile so I better do it soon. Lovely post on umeboshi! I buy them here in London, usually Clearspring ones and they are pretty nice, and no colouring. My japanese friend used to bring me 'karikko' ones, (I think I am remembering that correctly), which were crunchy. Are these made very differently? Thank you Maki and Maki's Mom! You description and photos make my mouth water. I've made my own tsukemono, but never tried making umeboshi. It's now on my "to do" list. Do you know if there is an English name for the ume plums? Or are they just sold with that description? There is no english name for Ume plums or Umeboshi, but sometimes they're called "Japanese Salt Plums", "Japanese Pickled Plums", "Pickled Ume Plums", or just "Pickled Ume" in the grocery store. I wonder if it's possible to make umeboshi with any other type of plum? Otherwise, do you know the scientific name of the ume tree so I can see if they are available in the USA? Thanks! Very small plums, about 1 inch in diameter can be used. Unfortunately they are hard to find in stores. Anything bigger will just turn to mush. I was fortunate enough at one time to have an apricot tree that produced very small apricots, just the perfect size for umeboshi. They turned out wonderfully. I have 6 "japanese plumb trees” They are yellow, sweet and about the size of apricots. Would they be good. or should I try and grow a ume tree? my aunt in canada missed having umeboshi so she started growing the red shiso leaves and made umeboshi's with apricot when they were still green. they will turn out with a milder taste but if you can't get ume these are the perfect substitute. i've made 4 batches of ume over the past 10 years..and still have some from the first batch. The botanical/latin name for the ume tree according to Wikipedia is Prunus mume. I've heard from people in Washington State, California and Georgia that ume plums are available. Good luck to everyone trying to make their own umeboshi! Another question...what is outcome if green shiso leaves are used instead of the red? i realize the red leaves provide the nice color, but I'm wondering if the green adds flavor or color. Green shiso won't give the ume a good color, and it also tastes rather different from the red kind (which has quite a strong flavor and is unsuitable for eating fresh really). Green shiso is best eaten fresh! That is really interesting. Green growers in the UK are trying to grow red shiso and sell it, but they claim its the same as the green leaves. Do you have any info how they are different and how you would use each normally? I wish I could buy grown red shiso and those plums to make umeboshi...one day! Have come to your blogs few times, it is so great and I love your blog and recipes very much! This Homemade Umeboshi is lovely and looking so yummy! Thank you so much for sharing your mom's recipe! I LOVE Umeboshi! I would love to make these but have no idea where to find ume plums in Winnipeg, its probably impossible! is very nice.. but I am not sure if I would be able to get any Ume in Sydney. What is the common name for Ume? or is there any other plums which I can replace it with? Hi Jeg, umm sorry, the question was actually about where to find ume in Sydney - not about where to buy (additive-laden) umeboshi in Sydney. Thanks for the great English explanation! Thank you so much for this authoritative recipe, my mom has been using many different recipes and trial and error to make the perfect ume products over the years. I just sent her your recipe, which is so detailed and so are the photos! Arigato and ganbarimasu! I'd love to try making these - but I haven't been able to get hold of the ume or the shiso. They might be a little bit lacking in flavour without those two ingredients! That is so awesome to see how this is done, even if it's just to see the process without ever having the intention to make it. I wonder if a similar process could be undertaken with another fruit. Wow Maki, this was a fantastic post! My Gichan made homemade ume years ago and I've always wondered how he did it. I love your blog and read often. Thank you so much. Oh wow! Thank you so very much for posting your mothers recipe! (And please thank your mother for the recipe as well!) I have been trying to find umeboshi to buy for a long time(I'm in a small area), but I will just make my own instead! This post has made me so very very happy! Thanks again Maki for another awesome recipe! I can't find ume here in Mexico. In Mexico Chamoy is considered a type of candy, isn't that odd? Dagashi kind of stuff. There's also the sauce version of it which is used as a dip and as a popular ice cream flavor. I have a theory that a long time ago someone from Japan brought Umeboshi to Mexico , it then became a hit but nobody ever bothered to write down the recipe, so ... what remains now is just a bastardized version of it. This year I'll try using these apricots to make Umeboshi the Japanese way. Wish me luck! Your theory's not too far off. As far as I can tell, Mexican chamoy are likely to have derived either from umeboshi or (perhaps more likely?) from a similar but sweeter Chinese preserved fruit. Really great information on Japanese foods here, and my interest lies specifically in Japanese Wagashi and Japanese-style western desserts and pastry. Look forward to reading more of your posts on these subjects. this is so cool! big thank you to your mother for writing that all down and taking photos!!! i wonder if ume plums are available in new york city? will have to inquire at the farmer's market! thank you for posting! Merci/Thanks for the idea and pictures of how to make this pickle. I will be trying it in France and using plums which are similar in texture, size etc. My red shisho leaves are a little slow at growing this year so I might just be able to add only a few. My (Japanese) husband will be happy when these are ready to eat! Thank you soo much for posting your mother's recipie! It looks really good. I'm just wondering one thing though, is there an alternative way to sterilizing the plums without using alchohol? Well, you can try heat sterialization initially of the jar and tools you will be using, but that gets difficult obviously once you have started the process! If you have a problem with alcohol (most of it evaporates after use) you will just have to try keeping your tools, the jar, etc. impeccably clean and hope you don't get funny molds. As a couple others have asked (I know just from reading a couple of other of your articles that you hate when people do this, but I have yet to see an answer), is it possible to use ordinary apricots for this purpose? If I do that, would I be able to adjust the flavor by adding the citric acid that would be missing? I see some other recipes call to add the shochu to the pickling vessel. Is this advisable, and why? Just curious to see if anyone knows a store where I could find red shiso in the Atlanta, Ga area? I live in Warner robins Ga. I have both red and green shiso growing in my back yard. But I do not have any idea where to get green umeboshi ume. If you like I can give you red shiso seeds this fall. Can you get my email address from this site? I have made a very good but not authentic version of this with English bullaces, a kind of small sour wild plum commonly found in hedgerows etc. It was very good! I would love to make these but is vodka really ok to use instead. I hate vodka by itself YUCK! Does the umeboshi taste the same with vodka? Can you even taste the alcohol? Our Family replaces the plums with apricots that are just starting to turn yellow. We also use a nearly one to one mixture of sugar and vinegar to soak the salted and dry fruit. The shiso is salted and dried and added after the apricots and vinegar/sugar mixture has soaked for three days. Are the unripe apricots sour enough? Because the thing about umeboshi that makes it umeboshi is that distinctive sourness. If it does work with unripe apricots that would be great for me since they are way easier to get here! My friend's ojisan made "umeboshi" with apricots and they're awesome! They're not very sour but still have the distict flavor. I don't know how he made them, but I highly recommend using apricots. I looked up this recipe because I noticed that my local market had "Sour Plums" in the produce section, and I wondered if they were ume plums and got excited to try to make umeboshi since all the store-bought ones are full of artificial colors and preservatives and chemicals. It's a middle eastern-ish market and apparently the plums are just eaten as-is (green and crunchy) with salt. They must be very seasonal because I've never seen them there before, but I'll definitely get a bunch and try this recipe! FWIW, you can get store-bought ones that aren't artificially colored, though it may take some looking. I like Iida's hachimitsu (honey) umeboshi -- no bad ingredients, not too expensive, nice flavor. Thank you for this recipe. Umeboshi is one of my favorite pickle foods. I can get umeboshi at a local health food store (Whole Foods carries it) but it's not the true gourmet version. I am at the end of a tiny crock of gourmet umeboshi sent to me from my sister that was probably close to $40. I'd love to become an expert at this and start making a batch every year. I found your blog by googling "umeboshi recipe" after I stumbled upon an Asian food market (specializing mostly in Korean) and they had fresh ume and shiso leaves. I bought a small bunch of ume and my first batch ever is being pressed right now. It's coming along very nicely but I think I may have used too much salt. I need to go find some bamboo baskets for the drying process. I'm also going to go back to the market and buy a bunch more ume and try a few more batches. After all, I will probably break into them early so I need more batches to make it to the prime 3-5 yrs. Thank you again for this recipe! My mother just sent me an enormous box of ume plums from her tree and I started making the umeboshi today. So fun! I used your recipe in combination with another from a friend, and now my ume are happily drying. My question for you is, what do I do with the dried shiso? Add it to rice after cooking? Soups? Miso? And can I use it before it dries to make rice? I thought the color and flavor might be interesting. Thanks! Hi Joan, congratulations on making umeboshi! The leftover shiso leaves are traditionally dried, and them pounded into a powder to make yukari, a type of furikake (stuff to sprinkle on rice and other things). It's usually dried in the sun, but you could dry it in a very low oven, turning frequently, until crispy and dry, then whiz it up in a food processor. Store it in airtight containers and enjoy! I hope you kept the pickling liquid also - that's called ume-su or ume vinegar, and is a wonderful flavoring condiment. I wonder if that could have been karin (the botanical name is Chaenomeles sinensis) - that makes a gorgeous cordial or liquor. But a lot of fruits are turned into cordials in Japan, it could have been something else too! it wasn't karin but maybe i should send you a picture sometime it could or could not be japanese related ahah my family make all sorts of food from different cultures but who know but i am starting to think they are apricots but it is hard for me to decipher since i dont eat them so i am not really sure what it looks like ow would you want me to send the picture? Uh, kumquats (called kinkan in Japanese) are tiny citrus fruits, and are nothing at all like umeboshi. In Japan they are often cooked in sugar syrup and used as a cold remedy. They're also used as garnishes, in jams/marmelades, and such. Just connect with a farmer and order some immature plums. I used plums from my golden plum tree when they were at the green stage. They looked and tasted just like umeboshi. Thanks for sharing the recipe. One of these days we need to try our hand at making these. My daughter Hana (10) eats umeboshi like candy. We actually have to limit how many she eats. My wife's sister makes them back in Okinawa and occasionally sends us a batch. You are right, home made are much better than store bought. I have been using Prunus cerasifera for umeboshi with great results. This is also a "plum" that is actually closer related to the apricot, just like Prunus mume. I dont use any alcohol, didnt know about it being used, the salt prevented any molds. The ume -"vinegar" is also great. Here in central Europe Prunus cerasifera is called mirabelle (that is wrong actually), so I call my umeboshi miraboshi instead. Interesting - is Prunus cerasifera the same or different from what's sold as 'mirabelle' in France? I wonder if prunus cerasifera is the kind of tree growing up the block from me here in Philadelphia. The leaves are purple all summer long, and the fruits are also purple from the beginning. They're about 1" in diameter and pretty sour. I just took my two little daughters with me to pick some, because they're already falling from the tree. I know there is red shiso in the neighborhood, but I don't know if I'll find it in time to include it in the recipe. My plums are soaking now! good morning, Mikw and Maki! good morning, Mikw and Maki! i believe i went all the way to the current time in the comments, but didn't see how the fruit from the red flowering plum turned out as umeboshe. i am trying the same, and hope that my impatience won't prove i wasted my time: i picked about ten pounds (i want to make chutney, too) and the fruit came away from the tree with their stems, proving they were not yet ripe. this is fine for the chutney i make, but is it the un-making of my erzatz umeboshi? i am about to use a non-iodized fine grain salt; will that also affect the flavor and/or structure of the finished pickle? please wish me luck and comment back! Thank you for posting such a detailed recipe, I can't wait to try it. Back when I was living in Japan, I tried making these once, but they came out way too salty. While I make umeshu every year, I haven't yet tried making umeboshi again, but I armed with your mother's recipe, I'm ready to give it another go. Thanks! Hi, Maki. We are talking about your recipe over in the comments section of this post at Serious Eats. My ume have been in for about 10 days (I just added the shiso leaves a couple days ago), but there is not enough liquid to cover the plums. Is it necessary for them to be *covered*, or is it sufficient to have them weighted down, salted, and pickling? Hi Jen, (I checked this with my mother) the liquid should come up to completely cover the plums. The weight was probably not heavy enough, or you didn't have enough salt to draw out enough liquid - or (though rather unlikely unless the plums were old) the plums were too dry to start with. Did you add at least 8% salt? Beginners have a lot more luck with at least 10-12%. You might try adding a bit more salt, and making the weight heavier too. (FWIW, dumbbells work well). Good luck! Hey Maki, thanks for updating this post. I've also been using this recipe as a base for some pickled Santa Rosa plums I'm making with excess fruit from our backyard tree, and it's been very helpful. One thing that is not clear to me: after the ume liquor reaches the point where it covers the plums, you say to leave the plums in the liquid until it's time to dry. About how long is this period normally? A few days? Weeks? Would a couple months be okay? Also, given that I live in the often-foggy Inner Sunset of San Francisco, I'm considering using my food dehydrator on the lowest-temperature setting to handle the drying phase. This is more or less equivalent to putting them in front of a fan indoors. Is this ever done in Japan in less-sunny years? Does the lack of sun exposure make a difference in the end result? Again, thanks so much for sharing this recipe, and for your wonderful food advice more generally. Hi Danny, the period is not exact - basically, usually the ume plums are available before fresh red shiso leaves are, so my mom leaves the ume in the liquid until she can get hold of the shiso. She says it's usually like 7-10 days. Using a food dehydrator may be an option, and it's possible commercial umeboshi use this kind of drying method. Keep in mind though that the sun's rays also help to kill off any mold-causing bacteria, so if possible it's best to dry them in the sun. Beware not to over-dry the plums if you're using a food dehydrator. I love umeboshi and I have a very prolific Santa Rosa Plum tree in my garden here in Roseville (Sacramento area). I'm curious if you continue to make umeboshi from your SR plums and if you have any tips and tricks to share? Especially at what stage do you pick the green plums? (Obviously not right now in June!) We are making plum jelly this week and it made me think of umeboshi. BTW we have plenty of sunshine.here in Sacto so bring them here to dry! Umeboshi: What type of shochu does your Mom use? I live in southern CA in the U.S. and have an ume tree. This recipe was really helpful. Does the type of shochu matter or is it just for disinfectant purposes and not flavor? I have sweet potato and barley shochu at home, but also like, when I can find it, sesame seed and rice shochu. If it does add flavor, does your Mom recommend a particular type and/or brand? Re: Umeboshi: What type of shochu does your Mom use? One of my most favorite foods. Thank you, thank you, thank you!!! You said you are "here in Oz" - do you mean that you are in Kansas, USA? I am in eastern Kansas, and several years ago my husband bought a red shiso plant at the farmers market not knowing what it was - he just thought that it was interesting looking. I forget what name he was given for it when he bought it, I think maybe "beefsteak plant" but I was pretty sure that it was shiso, and it is. It never actually got planted in our garden or yard, but has flourished in the "temporary" container in which he planted it. He was told that it was hard to grow from seed; however, not only is the original plant flourishing, we have volunteers all over our garden and yard. So, I guess if it seeds itself, it is not so difficult. hi - i think you got OZ wrong. OZ is short for Australia. Well actually i want to preserve it as the paste, rather than as whole plums. Does anyone know how long the paste lasts for? is it better to keep ume whole rather than paste? Thanks for the great post - and send your mum love from down under OZtralia!! Some Aussies love ume! How lovely! Thank you to both you and your mother for sharing this. I can't wait to give this a try! Ok, thank you very much for this. I am definitely trying this out. I didn't realize they last so long! I'm definitely going to try this out and make some good umeboshi. I <3 umeboshi so much! Thank you thank you thank you! I suppose Japanese umeboshi are different from Chinese salt pickled plum? (Ingredients say salt, water and plums). Can I "Japanize" them? I recall Japanese are more sour than the Chinese ones I have; is this because of the alchohol? I can't seems to find shiso anywhere (which I'm really sorry as I love them). I love your blog, and it's my no. 1 Japanese food resource! Love the effort you put in, and just when I started checking online regarding availability of these plums, I see the three year wait period soft note. Amazing, but I’m greedy. Thank you for this great recipe. My father has a friend in Japan who still makes umeboshi for us but he doesn't get there much anymore. She makes hers with a little honey which is how my daughter loves it. Do you know about making them a little sweet? I enjoyed reading your description on how umeboshi is made. I find it interesting and enlightening. I have never eaten umeboshi. However, after learning about it in Japanese cuisine, I have checked it out at our Aeon/Jusco supermarket. It makes me want to learn more about Japanese food and cooking. Thank you very much for sharing this recipe in your blog with everyone and teaching us another new thing about your tradition and culture! I also like dried Umeboshi from Okinawa...they are even sweet! I have heard so many good things about UMEBOSHI PLUMS, told to be poisonous when they are picked from the tree Is it true? What about the paste of umeboshi? Do you have the recipe for the dry, crunchy and salty version? The packaged ones are very pricey and I tend to go through them in minutes!!! So, you can get the ume fruit on the East coast apparently. I saw some websites where the trees are sold, and they are okay in this climate. Prunus Mume is the variety of tree. I'm trying this now with apricots. I know, i know, its not the same, but wanted to experiment. we had a problem with mold. We also are unsure about whether there was too much booze and/or salt. Oh well, its fun to try. Are shiso leaves essential for making umeboshi? I'm in Liverpool (UK) and saw a little jar of ume in my local Chinese supermarket. Can I use vinegar, instead of alcohol? If so, what vinegar would you recommend? Can I use vinegar instead of alcohol? If so, which one would you recommend please? I posted this before but i didn't choose the notification option, apologies for repetition. Thank you for this tutorial! I was wondering, is there anything special you have to do to make umeboshi paste from these? Or is it just pureed umeboshi? Great recipe! I can't wait to try it, but it would be a miracle if I could find real ume plums (I live in France). Does anyone know what would happen if I used another kind of plum? What about apricots or peaches? I won't be able to resist giving it a shot out of pure curiosity; I just hope I don't poison myself! Hi Maki! I hope that you still read these posts and will take the time to reply, I'm running into problems with making my umeboshi. This is my second try, I tried a previous year with little luck, and so far, I'm not having much luck again. On June 9th I started the umeboshi, using 11% salt and 50% weight on top of the ume; I weighed everything out on my kitchen scale. Things looked as though they were going well, and liquid was rising nicely. Then it seemed to have stalled about halfway up ume layers (2), so on June 26th I added another 50% weight, bringing the weight on top of the umeboshi to 100%. I'm using a clean bag of clean rocks as weight. It doesn't seem to be helping much, though admittedly at this point, it's only been about four days since I added that extra weight. My questions are: Should I wait and see? Should I add more weight? Add more salt? More salt and more weight? (And how long should it take for the liquid to come up over the top of the umeboshi? Any idea how much longer than a week?) Help, onegaishimasu! I really want these to work, I hope you can take the time to give me some tips on how to fix my umeboshi. I didn't see anyone else in the comments with a problem like this, so I don't think that I'm duplicating a question you've answered. I found that I had to use well over 100% of the weight of the ume in order to get the juice to come out. If anyone else other than Maki has any tips on my umeboshi troubles (see previous post above; in short, my ume don't seem to be releasing liquid as they should and I don't know what I should do) I'd love to hear them. I can't really find any information on umeboshi-making issues out there, and I'm at a loss. I'd hate to have to throw this batch out, they were doing so well, and the ume are ridiculously expensive here! So glad to find this page. I'm an umeboshi newbie in eastern Washington state and finally stopped tiptoeing and jumped in a couple of weeks ago using wild Prunus americanus I came upon while driving in the country. They were pristine, cherry-sized, pale green and sour, just verging on turning yellow, and I have 20 lbs fermenting along nicely in about 12% salt in a food-grade plastic former commercial 5-gallon pickle bucket I begged from a restaurant in town. I'm following a recipe that adds the red shiso (leached with salt and squeezed dry) after the drying, then covers again with their own vinegar and returns, covered, to storage for a year. (Or longer, say you.) Your mama's recipe confirms the amount of shiso I could hardly believe: 10% of original weight of fruit. So it's 2 lbs my niece will be mailing to me from a Japanese grocery in the Seattle area. If this turns out worth repeating, for my next batch I'll figure out how to grow my own red shiso. A tree nursery in the Willamette Valley offers P. ume, but I'm too motivated by my hunter-gatherer gene to wait that long. Thanks to all for sharing your experiences! Re troubles with getting brine to cover: I'm wondering if it might be a matter of volume. It would be interesting to know the quantity (weight, especially, but volume, too) Maki's mother starts her batch with and how much you are starting yours with. Just a hunch, I don't know the answer, and of course you're paying for the fruit, and paying well, you say. Good luck with saving this season's trial. I'm on my first go and wishing I could come up with beautiful baskets, like the ones pictured here, for the drying. I'd have to double check, but I think that I'm working with about a kilo of fruit. It runs anywhere from $15-$20/lb here, so needless to say, I wasn't going to be buying a lot of ume. I would love for Maki to chime in here with more details and some help. I've added yet more weight (so I'm now over the 1:1 ratio of weight, I'm around 1:1.5 now) and I sprinkled on a little more salt. I just don't know if at this point I should be tossing the whole thing out and wait for next year. What about using dried shisho leaf? I, too, am looking at possibly abandoning my lovely start and trying again next season--in my case for want of red shiso. Right now I'm shopping around a color photo of a potted one in hopes someone will say hey-I-know! A produce manager told my niece he only has the red leaf for about two weeks in the spring but his customers often purchase dried shiso for their pickled plums. Do you know of this, Maki, or is the produce manager perhaps referring to the already pickled and dried leaf that customers might buy to use as the yukari you were describing to us. If it's the right dried leaf to substitute for the fresh leaf, would maybe a third of the amount by weight be equivalent? I was glad to go back and read that your mum lets the plums wait in their brine "until she can get hold of the shiso." That's what I'm doing! Re: What about using dried shisho leaf? Hi Marilyn, dried red shiso sounds like yukari. I've never heard of anyone using dried leaves for making homemade umeboshi. Hi Shari. I would try adding more weight first and see how it goes. If you added too little salt though you may have a problem. If it starts to get moldy in any way you can't save it, but if not (and the weight doesn't work) try mixing in a bit more salt, then transferring to a thick plastic bag (or double-bag), liquid and all. Seal securely then massage it gently, and put it in the refrigerator, on a plate to catch the drips. Massage the bag and turn it 1-2 a day or so. You may be able to salvage it this way. The method described at the first link should work. But always trust your palate - if the remaining umeboshi have any hint of moldy flavor the mold has probably spread too far. Saved! It pays to read even a third time: If I fail utterly to score any shiso leaf this year, there's shisoless white umeboshi to be made, yay! Saved! It pays to read even a third time: If I fail utterly to score any shiso leaf this year, there's still shisoless white umeboshi to be made, yay! I live in the Midwest part of the United States, and have a very close Japanese friend who taught me to appreciate Japanese foods. I make umeboshi using our wild plums, and they taste almost identical to Japanese plums. My Japanese friend even agreed. I love using the vinegar or brine from making them in salads and for cooking. I'm about to score a pound of red shiso leaf, which is only half the amount specified by both your mom's recipe and the recipe I actually embarked upon before I found this blog for the 20 pounds of plums (in this case wild, not ume) I started with. The method I'm using salts the cleaned leaves lightly to wilt, squeezes out the liquid released, then mixes and lays down the leaves together with the sun-dried plums and covers them again with the reserved brine to cure for a year. I figure there must be a flavor benefit to leaching the leaves and have also read that the leaves have antiseptic properties; surely that will aid in preserving the pickles. Hmm, I'll go ahead and ask for opinion about the effect of a short shiso ration, but as I write this out, I'm thinking what I might do is put up only half the dried plums with these leaves and keep trying to get more leaves. Again, comments welcome, don't hold your punches! Maki, I only just came upon the part of your blog about your grave health matters. Please know I'm visualizing your body in glowing health and adding my spiritual vibes to all those coming your way for your complete recovery and long life. My pound of leaves arrived today by express post in what appeared to be excellent condition, crisp and crinkly. To me the scent was similar to that of cumin and most appetizing! After rinsing away the silt and separating the stemmy parts, the usable weight obviously dropped some, then the light sprinkling of salt and squeezing reduced the volume that had nearly filled my sink to a mere double handful. So that's what the surprising quantities in the recipe were about! This amount, interspersed with half the dried plums and half the reserved brine, now comes to about one gallon, and I'm pursuing a new lead for another pound-plus of red shiso leaf for the other half of my dried plums. One thing I noticed when dipping up the plums for drying: There was perhaps a tablespoonful of undissolved salt in the bottom of the crock, evidence that the brine is just at the saturation point for salt. Then the extraction of water from the plums by the sun-drying might be expected, on reconstituting them in the brine, to raise the salt level again. So won't I have a little wiggle room to top up with a bit of water without losing the plums to mold? I love reading over all these posts. I was trying to find where you or somebody told how adding water with just a little salt in it gets the salt moving to redistribute better than adding plain water does. And the one from Lynn two Augusts ago that said the long brine curing seemed to solve her mold problems so she ate them anyway, wonderful! My family have all chimed in ("What the heck are you making?") from their far-flung locations up and down the west coast and have joined my shiso search. And I loved knowing I was only two days off this year's date for Doyou no ushi no hi and had a run of seven hot, sunny days for the drying. Maybe you would tell us if there's an eel run in the rivers at that time, or what? Making umeboshi in the UK? I live in the UK and I haven't found anywhere I can buy umeboshi and to buy it online would make it extremely expensive, especially considering I've never tried it so may not like it. My main question is could I hypothetically make an umeboshi substitute using nectarines? For everyone's information. the Plum used for umeboshi is just called a plum, it is actually an apricot called scientifically as "prunus mume". It along with the "red shiso" seeds can be bought at amazon. Thanks! I lost a few to mold because the juice didn't come up quickly enough, but I think I salvaged the batch. A friend just scored me some shiso, so that's going in this week. 1. Instead of Red shiso leaves I used red basil, it's the same family, it is available year around and it worked great! 2. drying out the umeboshi - I never did get around to taking the umeboshi outside for drying, but my husband found the undried ones too fruity so I dehydrated them in the oven around 180 degrees overnight. This created very dried umeboshi just like my husband likes, if you want them slightly dry I would dry for less time 4 hrs may be? This year we are planning to make even more. Great recipe, thank you. Hi!Do you think that one of those plastic japanese pickle presses used form making tsukemono would work for the umeboshi? or do you think that there might be adverse effects from the long incubation? You don't need to press the ume fruit, and in fact doing so would ruin them. I would not use plastic either, because of the acid and salt. Best to stick to glass or ceramic, or enamel (making sure it has no chips or anything) for making umeboshi. Thanks so much for writing this blog. I used it to make my umeboshi. I started about a month ago and today I took them out of the brine to dry. I even ate one because they looked so good and it was delicious. I am sure they will get even better with age. I love this blog and your bento blog too. Thanks for your help! My mother [_my grandmother - maki_] used to make umeboshi every year. When I lived in New York, I was too busy working to do much cooking, let alone umeboshi! But now that I am retired, I'm trying to remember how to do things the old way. Homemade umeboshi is so much more delicious than store bought, so they are worth the effort. Once the stems are removed, wash the plums in several changes of water, and then __fill a large bowl with cold water and leave the ume plums to soak overnight__. This gets rid of some of the bitterness in the plums. Once the container is full and weighted down, cover the top with a clean, porous cloth like a cheesecloth or openweave kitchen towel; secure this with a rubber band or string. Leave in a cool, dark area of your house, until the ume plums become soft and __completely immersed in a reddish liquid__. This liquid is extracted from the ume plums by the salt. This part of the process will take about a week or more. The _hoshi/boshi_ part of umeboshi means 'to dry', and the following drying step is very important! In Japan, we time the umeboshi process so that the ume plums reach the end of the salting stage around _Doyou no ushi no hi_ （土用の丑の日), which falls on a different day every year, but is always around mid to late July. This date is always marked on Japanese calendars, along with other holidays and special days, just like Christian holy days are marked on European calendars. The significance of this day for umeboshi making is that it occurs after the rainy season is over, when the weather becomes hot and relatively dry (this period is called _doyou no hi_ （土用の日), the doyou period). If you are not in Japan, just look at the weather forecast and aim for a period of a few days when it's supposed to be nice and hot and sunny. Thank you for the recipe. I'm hoping to try it very soon, but I was reading the questions and answers in your comments section to see if anybody asked about how humidity affects the drying stage. I didn't see anything so I will post my question: I live in Hawaii, a nice, hot, and sunny place...but it's also humid. It's currently 78% humidity. Are there any other options to drying the ume in the sun? Thank you. Most of Japan is very humid in the summer too. If you don't want to dry the umeboshi in the sun, you could try the oven at a very low setting, but you will need to watch out for over-drying. My Japanese grandmother made these also--sooo good with hot rice! I have a somewhat related question: Do you have a recipe for pickling aka-jiso with salt and vinegar? I used to help my dad harvest, wash, and pack the jars--putting salt between the layers of leaves and then adding the vinegar. I recently read a recipe that recommends squeezing the black liquid out of the leaves before preserving them. I do not recall that we did that step, and the pickles always turned out amazing-no bitterness, etc. Alas, I do not have the recipe--only a memory of using about 1/3 c salt and adding vinegar. Thanks! Just trying out my umeboshi made this past summer. Looks good but too salty and a bit too hard. Should I water down the liquid or just keep aging them? Also, can I add shaved bonito to some of them? Ms. Chera Kim in California, contact her at 760.797.5087---she ships throughout US and season usually ends mid-June. thank you for posting this process and all the tips and tricks you've learned from your mom! I'm in the middle of my first attempt at making umeboshi and so far everything is looking good. yay! ;) I did have a few questions about storage... you mention umeboshi taste better with time and recommend a three year "aging" process. what's the best way to store them during this time--do they need to be refrigerated or are they shelf stable? I was planning to split the batch and add umesu back into only half the batch. would that matter for storage? thanks in advance for your time and help with this inquiry. I'm so happy with my jar of umeboshi and can't wait to try them! This year we finally have maybe enough small wild plums to try it out and i'm growing red shiso. keeping an eye on the plums so they not over ripe. I have never tried umeboshi before but they look so interesting here. Thanks for sharing your tips. Last year I tried, it was a glorious failure, as mold grew everywhere. Now I try again, but this year white umeboshi, as my one shiso plant is ca. 2 cm tall now and have 4 little leaves (laugh if you want to). I matke it with small, tart plums from a nearby wood, as ume does not grow in Denmark and I found out they're near cousins. Now my question. When (if) I reach the drying stage, could I then use a dehydrator, as our autumn is windy and rainy, or does the Sunshine give something extra?